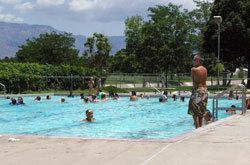 Montgomery Pool is a 25-yard outdoor pool. Practice is Mondays through Fridays from 7:15 a.m. to 9:30 a.m. starting June 3, 2019. Monday - Friday 4 p.m. - 5 p.m.